US 81 south Chickasha, OK, turn left at stoplight on to OK 19, go 2 miles east to Quail Rd, turn right historical marker is on Left side of road, go .01 mile marker and pavilion are on the right. Fred, Chickasaw Nation, Indian Territory, was a trading center located at the cross roads of the cattle trail coming up from Texas, since called the Chisholm Trail; and the overland wagon road from Ft. Smith, through Atoka and Boggy Depot, to the newly established post at Fort Sill, the Kiowa Comanche Agency located near Ft. Sill, and the Wichita Agency near Anadarko. On the highway about three miles east of Chickasha, on the Alex, Lindsay, Pauls Valley road, can be found traces of those two most historic trails of Western Oklahoma. 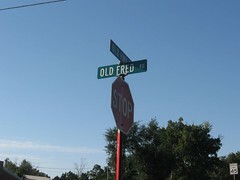 There can also be found remains of the once thriving community, called Fred. One of the old buildings still stands; the grave yard not far away and traces of the old stage coach stand are all silent reminders of the past. FRED: Dave and Scott COOK had the post office at Fred, and they ran a general merchandise store. Mail was delivered at Fred about once a week, being carried in a stage coach or hack. From Fred the stage coach went to Anadarko, and then back on its way to Pauls Valley and Caddo. Source: Indian Pioneer Papers, Bunk Moncrief interview, October 13, 1937, at Chickasha, Grady Co., Oklahoma.